easy-off is a biodegradable, safe graffiti removal chemical suitable for cleaning graffiti from around 60% to 80% of porous substrates and almost 100% of hard non-porous surfaces. easy-off graffiti removers are COSHH and CHIPP compliant and are fine to be used by anyone – anywhere. Plastic and polycarbonate safe, easy-off graffiti removal products make ideal “all purpose” graffiti removers to deploy as part of a graffiti removal service and keep aboard any graffiti removal van. Urban Hygiene recommends you start your graffiti removal process with easy-off graffiti removing products then if graffiti shadows or ghosts are left behind, hit those areas of ghosting with a more powerful graffiti removal chemical such as Graffiti Shadow and Ghosting Remover. 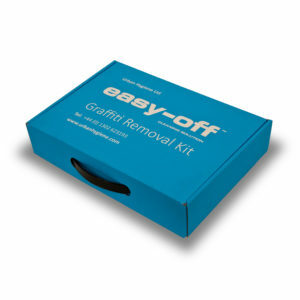 easy-off graffiti removal products are chosen by graffiti removal companies and local authority graffiti removal professionals because they get the job done whilst being considerate to the environment and non-harmful to the graffiti removal operative and members of the general public. Compatible with high-pressure spray graffiti removal techniques and neutralised by water easy-off graffiti removing liquids and graffiti wipes are one of the UK’s most highly regarded safe graffiti removers.